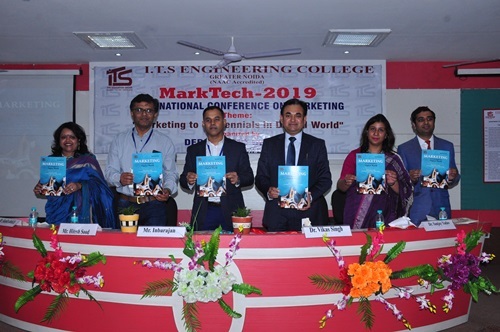 Greater Noida (5/4/2019) : Department of MBA, I.T.S Engineering College Organised the 1st International Conference on Marketing “MarkTech” on 5th April on the theme “Marketing to Centennials in Digital World”. Hitesh Sood, AVP & Head (Marketing), Vodafone Idea was the chief guest and Inbarajan, Senior Vice President- Growth & strategy, Info Edge India Ltd (Naukri.com) graced the occasion as the Key note speaker for the day. The conference also featured some high profile speakers like Vikas Sachdeva, Country Head (International Ad Sales) at Star TV Network and . VivekPaladhi, Regional Sales Head, Paytm; and panelists like AnimeshPuri, Senior Business Development Manager, Alibaba Cloud; . Divya Agarwal, Project Manager, Grail Insights and Y. Atul Mohan, Area Sales Manager, Nestle India who shared their valuable thoughts and insights with the students in the various sessions. The Conference was inaugurated by the Chief Guest, Key Note Speaker, SohilChhadha- Vice Chairman I.T.S Group, Dr. Vikas Singh- Executive Director, . Gagan Deep Arora- Dean Academics, D. Sunita Shukla- Head MBA Department & Dr. Pallavi- Convener of the program. Conference Chair, Dr. Sunita Shukla, has presented the objectives and program highlights of MrkTech 2019. The Executive Director Dr. Vikas Singh welcomed all the dignitaries and explained in details about the great importance of the theme of the Conference. In the felicitation speech, Chief Guest, Mr. Hitesh Sood, AVP & Head (Marketing), Vodafone Idea has highlighted on how the digital trends are shaping India and disclosed various facts about digital world. Sri Sohil Chaddha ,Vice Chairman- ITS Group of Education has extended his heartiest welcome to hon’ble Chief Guest & all Delegates . He said this forum will give a huge exposure to focus on the contemporary and emerging trends of marketing to centennials in the digital world. The conference ended with the valedictory session where the winners of the Best Research Paper were awarded and Certificates were given to all the Paper presenters and participants. The conference was attended by faculties of MBA, Head of other Departments along with MBA students. Arun Jaitley targets Congress over AugustaWestland scam, Asks Why Rahul Gandhi silent on such serious allegations?